The Russian Federation is struggling, since Perestroika and the Glasnost, in a futile attempt to become a 'normal' member in the occidental family of market economies. The attempt largely fails because corporations do not live up to Western standards of behaviour, and private contracts are often not respected. What is the cause of Russia's observed difficulties? It is commonly believed that these difficulties are an expected outcome of a rocky transition from a Marxist, centrally planned system, to a market-based economy. This 2007 book challenges the accepted wisdom. In tracing the history of contract and the corporation in the West, it shows that the cultural infrastructure that gave rise to these patterns of economic behaviour have never taken root on Russian soil. The book's main thesis is supported by an in-depth comparison of Western and Russian theology, philosophy, literary and artistic achievements, musical and architectural idioms and folk culture. 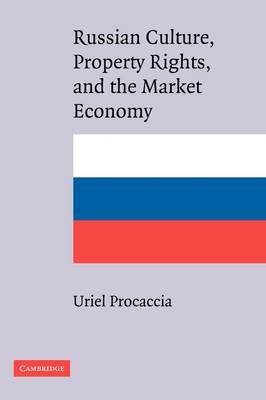 Buy Russian Culture, Property Rights, and the Market Economy by Uriel Procaccia from Australia's Online Independent Bookstore, Boomerang Books. Uriel Procaccia is a professor of law at the Interdisciplinary Center in Israel. He is also a long-term visiting professor of law at the Benjamin N. Cardozo Law School in New York City and a member of the Rationality Center at The Hebrew University of Jerusalem. He previously acted as Dean of the Law School at the Hebrew University of Jerusalem. He has written numerous books in Hebrew including a major work on the theory of corporate law and a major text on the law of bankruptcy and was responsible for drafting a new corporate code for his country, which became binding law in February 2000.